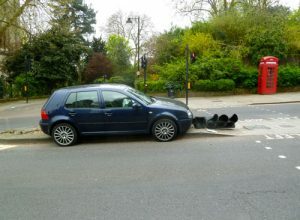 The early hours of this morning saw yet another car crashing into the Highgate Hill traffic lights. 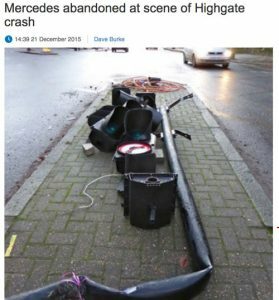 When will the authorities do something to make this road – and other Highgate accident hot spots – safer? I say “yet another”. The last at exactly this spot was as recently as December. That one was reported in the Ham&High. There was another one, also last December, a couple of hundred metres downhill when a car hit the Popes Eye Steak House. That Ham&High article noted two other crashes on the Hill. There seems to be a pattern. This was yet another night time crash. And a car going up hill and straight into the traffic lights. It’s obviously a dangerous stretch of road – people in the cars must be getting hurt and if it carries on a pedestrian will too. Then it takes ages – often months to get the repair made fully good, with traffic snarled up for some days with temporary lights. Surely it makes sense to look at the lay out of the junction. 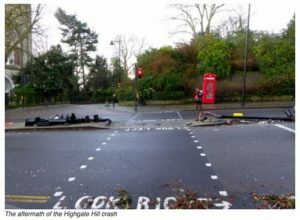 The two lanes on Highgate Hill up to the junction become one lane after the junction without warning. 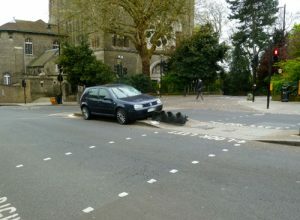 There’s no excuse for bad driving, drunk driving or speeding but the junction makes itself vulnerable. 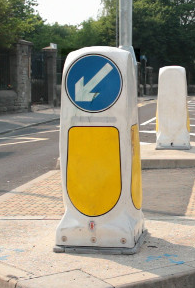 After the last incident the authorities never replaced the lit arrowed bollard (like the one in the image). Perhaps a granite protection bollard is needed too. It would save money in the (not very) long run and must improve safety to do something. Delighted to see the article picked up by the Ham&High, helping to raise the profile of this issue.